Abilene, Texas: Leafwood Publishers, 2009. 262 pages. In what he calls a “bridge commentary” on the book of Hebrews, Edward Fudge attempts to bridge three gaps in Hebrews: Ancient Encouragement for Believers Today. First is the gap between academic specialists and lay readers. The commentary relies on Greek text but contains no Greek. Second are the gaps among different versions of the English Bible. The commentary supplies its own unique translation based upon the commonalities of other standard translations. Third is the gap between various theological interpretations of Hebrews. The commentary presents various views and elucidates what they have in common. Fudge’s methodology is not Greco-Roman rhetorical analysis. Rather, as a longtime teacher and preacher, he offers readers a different but equally valid and spiritually satisfying approach to what he calls the “book of unknowns.” For Fudge, Hebrews is a book that illustrates “how the early church could always be talking and thinking and preaching and studying about Jesus — with no ‘Bible’ except the books we call the Old Testament.” Following that view, he considers Hebrews as a message of encouragement built around the framework of Psalms 8, 95, 40 and 110. Most readers, therefore, will find this meditative, homiletic approach to be satisfying and personally edifying. Although Fudge’s commentary targets Sunday school teachers and devotional readers as much as seminarians, it is not “Hebrews Light.” That is, while the author’s style is conversational and his comments are pastoral and practical, he does not ignore the complex theological issues raised or the serious warnings contained in the book. Fudge laments the neglect and disuse that have befallen the book of Hebrews in recent decades. 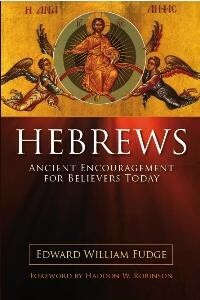 He counsels that Christians are missing a great source of intellectual nourishment and spiritual encouragement from this mysterious and magnificent treasure: the book of Hebrews. As Christian communities who need encouragement and who desire to grow in our capacity for theological reflection, we now have in our hands some excellent new tools. LINDA KING is an attorney in Edmond, Okla. She is a doctoral student in New Testament Interpretation at Brite Divinity School at Texas Christian University in Fort Worth, Texas, and a member of the Dayspring church in Edmond, Oklahoma.